Kempinski comprises a 5-Star Hotel, an office building and a low rise serviced apartment block. There are 105 serviced apartments ranging from a 76sqm 1 bedroom layout to a 193sqm 4 bedroom layout, with some apartments being a split double storey loft over two floors. The apartments are modern in design with spacious living room and open kitchens, and provide a 5-Sar Hotel service. The apartment building is in a German style of architecture built to the highest quality, and the compound is well managed with an enclosed private garden. 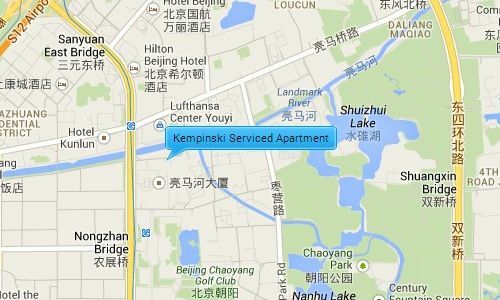 Kempinski is located perfectly in the heart of a several major transport routes including the 3rd Ring Road, the Airport Expressway, and Subway Line 10, as well as being within walking distance of Chaoyang Park. It is located right next door to the Lufthansa Shopping Mall where there is a large range of shops, restaurants, bars and banks., and is close to the popular expat area of CBD the financial centre of Beijing.